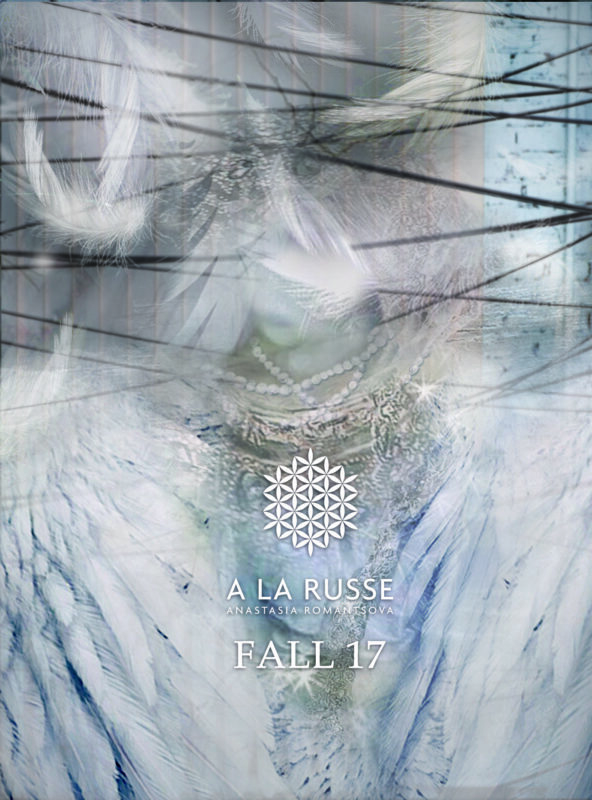 The central image in the A LA RUSSE Anastasia Romantsova Fall-Winter 2017 collection is the brilliant Annunciation Bird. This magic bird features in many Russian fairy tales and ancient beliefs. She was a symbol of happiness and a bringer of good fortune. By mysterious threads,this fabulous winged creature is transformed into the image of a beautiful girl. Unearthly beauty and goodness emanate from the delicate features of her face, from her sensual lips, from her unique oval face and from her penetrating eyes. She delights with her nobility, with her grace and her tender concern. She inspires with her strength and her determination. Every movement, every look shines with her strong-willed character and sensual femininity. She is the Annunciation Bird. She is the messenger of other worlds. She is always good news. The keen allure and mystery of the mysterious bird comes alive in the variation of textures and the play of reflections. Smoky rose, gray ash, matt gold are the main colors of the collection, matching the plumage ofthis celestial creature. The oh-so-delicate prints and details of the collection hint at the gossamer-light feathers of her female incarnation. Long dresses of flowing silk reflect the ease of this heroine. Garments of crepe highlight her feminine shapes and curves. Every subtlety becomes remarkable in this light. A narrow cut-throat becomes an elegant and long neck. A beautiful dress with high slits reveals graceful legs and slender ankles. But pay special attention to the sleeves: the soft, flutteringwings of this Pushkin princess waft magic in its purest form. The A LA RUSSE Anastasia Romantsova Fall-Winter 2017 collection tells the story of the uncanny, so unendingly attractive to the human soul. It takes us from mundane reality into a wonderful fairy tale, into myth – and the unfathomable mystery of existence.